We respect the intellectual property rights of others. Our Terms of Service prohibit posting content that violates another party's intellectual property rights. As indicated in our Terms of Service, we may, in appropriate circumstances and in our discretion, remove or disable access to, material that infringes on the intellectual property rights of others, and restrict or terminate access to our Platform for those who may be repeat infringers. The two most common types of intellectual property disputes that arise on our Platform are disputes regarding copyrights and trademarks. For more information regarding copyrights and trademarks, see the Legal FAQs, including What's the difference between copyright and trademark?. We have adopted a copyright policy consistent with the Digital Millennium Copyright Act to block access to or remove content that we believe in good faith to be infringing based on a bona fide notification that complies with the Digital Millennium Copyright Act. Note that under 17 U.S.C. § 512(f), you may be liable for any damages, including costs and attorneys' fees incurred by us or our members, if you knowingly materially misrepresent that content or activity is infringing. If you are unclear whether the content at issue is infringing, you should consider contacting an attorney. To report an instance of trademark infringement, please follow the instructions in the following section. What should I do if I see material that I believe infringes on someone's intellectual property rights? If you believe that content on the Meetup website violates another party's intellectual property rights, you should contact the rights owner directly so that they may evaluate the use of their material and determine whether to report the situation to us. If you believe that content on the Meetup website violates your intellectual property rights, you may send a notice containing the following information to our Copyright Agent listed below by email to legal@meetup.com or through our support form. Please submit this information in English in the format below. If the content at issue is claimed to have infringed copyrights, then this notice must comply with sections 512(c)(3) of the Digital Millennium Copyright Act. Note that we may provide your contact information to the member that has posted the content you claim is infringing. A description of the content or other material that you claim has been infringed. Although not required, please provide us with copies of, or reference to, the content that you claim has been infringed (with registration numbers, where applicable). A description of where the material that you claim is infringing is located on the Meetup website. Please provide specific URLs where the content is located. Also please provide a specific description of the material that you are claiming is infringing so that we are able to identify it on the specified webpage. An explanation of how the content on the Meetup website infringes on your intellectual property rights. For copyright disputes, providing this information is optional. This information is not required under the Digital Millennium Copyright Act. However, by providing this information in your initial report you may help us better understand the situation without seeking additional information, which may result in a faster resolution of the situation. For trademark disputes, providing this information is important to help us understand how the content on the Meetup website causes confusion or is misleading in terms of the product or services. Be aware that that under 17 U.S.C. § 512(f), you may be liable for any damages, including costs and attorneys' fees incurred by us or our members, if you knowingly materially misrepresent that material or activity is infringing. If you're unsure whether the material you are reporting is infringing, you should contact an attorney. A statement by you, that the above information in your notice is accurate, and under penalty of perjury, that you are the copyright or intellectual property owner or authorized to act on the owner's behalf. Please note that we may send a copy of any legal notice we receive to the member claimed to be infringing on content, the Organizer of the group, or a third party, such as Lumen for publication. What should I do if content that I posted was removed or I received a notice that my content infringes on someone's intellectual property rights? If content that you posted was removed or you received a notice that your content infringes on someone's intellectual property rights, you may send us a counter-notice to dispute the matter. Please submit this information in English in the format below. If the content at issue is claimed to have infringed on copyrights, then this counter-notice must comply with sections 512(g)(3) of the Digital Millennium Copyright Act. Please provide specific URLs where the content was located and a specific description of the content. A statement by you under penalty of perjury that you have a good faith belief the material was removed by mistake or misidentification. Please note that we may send a copy of any legal notice we receive to the person claiming that their intellectual property rights are being infringed, or a third party such as Lumen for publication. Meetup brings people together in thousands of cities to do the things that matter most to them. Member participation is essential to help us fulfill our mission. As part of that, it's important for members and others to be able to identify Meetup’s services without being confused about our association with other companies or websites. These guidelines are designed to help you understand how you can use Meetup’s trademarks, including logos and word marks. Meetup’s marks should only be used as discussed in these guidelines. Hopefully these guidelines give you a clear idea of how our trademarks may be used, but if you still have questions or you would like to use our trademarks in a way that is not addressed, you can email us at legal@meetup.com or contact us at the link below. A trademark is a word or symbol that identifies the products or services of a company and distinguishes them from the products and services of others. The word “Meetup” and the other Meetup Marks, such as our Logos, designs, slogans and names are registered trademarks or trademarks of Meetup, Inc. in the U.S. and/or other countries. - DO make fair use of the Meetup word marks. You do not need our permission to use the word “Meetup” to make an accurate and truthful statement about Meetup. - DO NOT use a Meetup Logo in a way that may falsely imply a relationship with, or endorsement by, Meetup or its employees. - DO NOT use any trademarks, service marks, designs or logos, including domain names or social media handles, that are confusingly similar to the Meetup Marks. - DO use the new Meetup Marks, which are above, and not our old logos, as permitted under these guidelines. - DO include the name of your group along with a Meetup Logo. 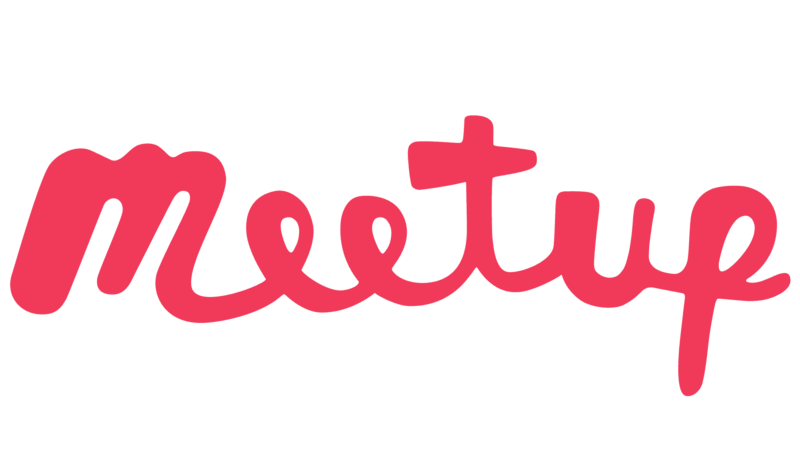 - DO NOT alter distort or modify a Meetup Logo, except as described below in connection with a Meetup Logo Variation. - DO include the name of your group along with the Meetup Logo Variation. - DO include with each Meetup Logo Variation a clear indication that the event or group is organized using Meetup, for example by also including a Meetup Logo. - DO NOT put ‘Meetup’ in your product name, domain name, social media handle or your own trademark (including logos or images). ‘Meetup’ should only be used in the description when you are indicating that the app works with our site or API. - DO make sure that your logo has a unique and distinctive look. - If it includes a design element that is the same color as a Meetup Logo. - If it includes a ‘handwritten’ font style identical or confusingly similar to the Meetup Logo. - DO make it clear that your service was developed and is provided by you and not Meetup. - Organizers and members must comply with our Terms of Service regarding permitted and prohibited conduct on our platform, and also the provisions regarding right to use, limited license, and indemnification. - Developers must also agree to the Meetup API license provisions. We reserve the right to withdraw permission to use the Meetup Marks, a Meetup Logo Variation or otherwise alter these guidelines at any time. Meetup remains the exclusive owner of all rights, title and interest in the Meetup Marks. We respect the intellectual property rights of others and posting content that violates another party's intellectual property rights is prohibited by our Terms of Service. As indicated in our Terms of Service, we may, in appropriate circumstances and in our discretion, remove or disable access to, material that infringes on the intellectual property rights of others, and restrict or terminate access to our Platform to those who may be repeat infringers. If you believe that content on the Meetup website violates your intellectual property rights, please send a notice containing the information below to our Copyright Agent (information below). If you are unsure whether content appearing on the Meetup platform is infringing on your intellectual property rights, you should consider contacting a lawyer. For more general information, you may also take a look at this article from our Help Center that points to additional legal resources. Please submit this information in the format below and in English. If the content at issue is claimed to have infringed on someone's copyrights, then this notice must comply with sections 512(c)(3) of the Digital Millennium Copyright Act. For more information about the Digital Millennium Copyright Act and other issues regarding intellectual property, see our FAQ regarding legal issues related to using Meetup. 3. A description of where the material that you claim is infringing is located on the Meetup website. 4. An explanation of how the content on the Meetup website infringes on your intellectual property rights. Please note that we may send a copy of any legal notice we receive to the member that posted the content, the Organizer of the group, or a third party, such as Lumen for publication. If content that you posted was removed or you received a notice that your content infringes on someone's intellectual property rights, you may send us a counter-notice to dispute the matter. Please submit this information in the format below and in English. If the content at issue is claimed to have infringed on someone's copyrights, then this counter-notice must comply with sections 512(g)(3) of the Digital Millennium Copyright Act. For more information about the Digital Millennium Copyright Act and other issues regarding intellectual property, see our FAQ regarding legal issues related to using Meetup. 3. A statement by you under penalty of perjury that you have a good faith belief the material was removed by mistake or misidentification. 4. A statement that you consent to the jurisdiction of Federal District Court for the judicial district in which your address is located (or New York County, New York if your address is outside of the United States), and that you will accept service of process from the person who provided notification of infringement or an agent of such person. The counter-notice may be sent to legal@meetup.com. Please note that if the information contained in your notice is knowingly misrepresentative with regard to alleged infringement, a court may hold you liable under 17 U.S.C. Section 512(f). If you are unsure whether you have the rights to content appearing on the Meetup platform, you should consider contacting a lawyer. For more general information, you may also take a look at this FAQ from our Help Section that points to additional legal resources. Generally, the name and description of a Meetup Group, as well as other content posted to the site, is owned by the person who posts that content as long as that person didn’t copy or take that content from someplace else. For most groups that means that the Organizer has the rights to the group name, description etc., and each member has the rights to the content that they post, such as comments. Unless there is an agreement between an Organizer and members of that group, an Organizer does not acquire ownership of content posted by members. However, an Organizer or member does not establish or create any ownership rights in content simply by posting that content on the Meetup site. If another person or entity owns the content that was posted, that other person remains the owner of that content and the member that posted the content may have legal liability for using that content without permission. Where can I get more information about the legal issues related to using Meetup? Meetup does not claim ownership of any of the content posted by members. By posting content to our site, a member does not give to Meetup any ownership rights that they may otherwise have, although they do grant to Meetup a license to use that content. This is discussed in Section 4.2 of our Terms of Service. Copyright and trademark help to protect different types of intellectual property. The distinctions between copyright and trademark are important; they protect different things and are enforced through different laws. Copyright law protects original works of authorship fixed in a tangible medium of expression. It does not protect ideas themselves; rather, it protects unique expressions of ideas. For example, copyright can protect things like books, song recordings, and movies. Copyrights can also protect things as "small" as a digital photograph or a single written sentence. In the context of Meetup, copyright may protect the content on a group page (such as the description of the group) from being used by other groups. For more information, visit: U.S. Copyright Office: Frequently Asked Questions or Teaching Copyright, a project by the Electronic Frontier Foundation. Note: This is general information and not legal advice about any specific situation. You should consult a lawyer for advice about your specific situation.